UPTON, NY–Scientists studying plant cell walls–structural supports that help plants overcome the downward pull of gravity–have discovered mechanistic details of a protein involved in the assembly of lignin, a key cell-wall component. The protein acts as a targeted “electron shuttle,” delivering the “fuel” that drives the construction of one specific type of lignin building block. The study, published in The Plant Cell on April 8, 2019, by scientists from the U.S. Department of Energy’s Brookhaven National Laboratory and their collaborators, revealed that this particular electron shuttle was different from those that drive the production of other kinds of lignin precursors, said Chang-Jun Liu, the Brookhaven Lab biochemist who led the research. These findings suggest that controlling the relative abundance of electron shuttle proteins could be a new strategy for steering which cell-wall building blocks are put in place as plants grow. “Much of this previous work has directly targeted the enzymes that steer carbon into different biochemical pathways,” said Brookhaven’s Liu, who also holds an adjunct position at Stony Brook University. The scientists identified the specificity of the electron shuttle protein through detailed studies of the biochemical pathways that lead to the synthesis of three different lignin precursors. They already knew that the synthesis of each lignin subtype–H, G, and S–is controlled by a different oxidative enzyme as part of a single, three-step hydroxylation process. “For all three, the enzyme itself is insufficient for the reaction to go forward,” Liu said. Each one needs electrons, delivered by a partner protein. “We used the three enzymes in the pathway as bait,” Liu said. In addition to identifying an electron carrier already known to play a role in the lignin synthesis pathways, these “immunoprecipitation-mass spectrometry” studies revealed that a set of previously unidentified partners were also interacting with some of the enzymes. 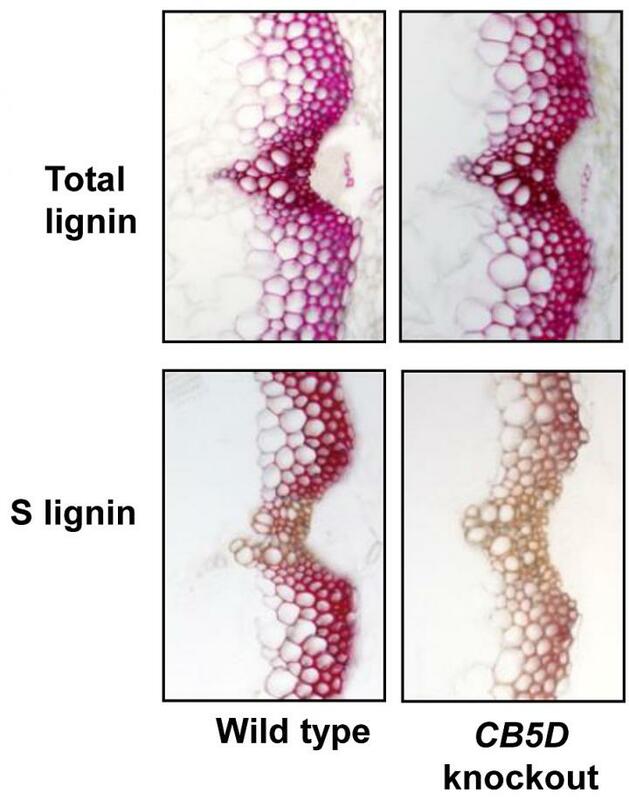 They found that deleting the gene for one of these proteins only affects the production of S lignin. They concluded that this “newly identified” electron-shuttle protein must be associated with the last step in the three-step process–the one that produces S lignin. This research was funded by the DOE Office of Science (BES). Two of the collaborators were partially supported by a scholarship from the China Scholarship Council. Part of the research used a confocal microscope at the Center for Functional Nanomaterials, a DOE Office of Science User Facility at Brookhaven National Laboratory. Brookhaven National Laboratory is supported by the Office of Science of the U.S. Department of Energy. The Office of Science is the single largest supporter of basic research in the physical sciences in the United States, and is working to address some of the most pressing challenges of our time. For more information, please visit https://science.energy.gov/. Follow @BrookhavenLab on Twitter or find us on Facebook .